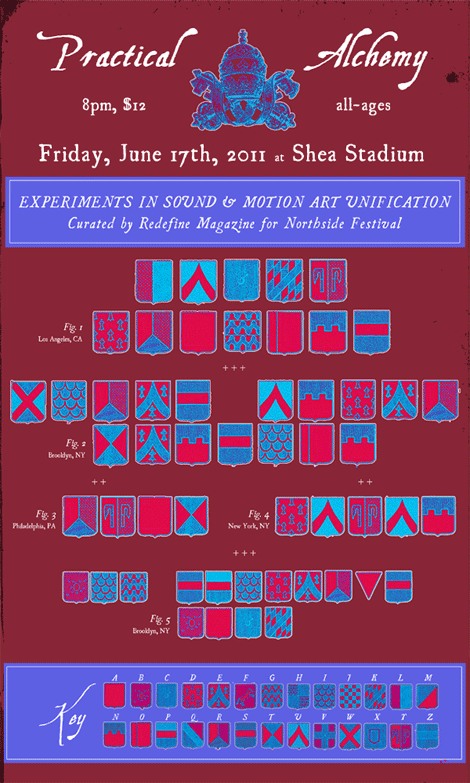 Through a serendipitous string of events, Pacific Northwest-based Redefine Magazine was invited to curate an official showcase for 2011’s Northside Festival in Brooklyn, New York. This showcase will mark Redefine’s second event in the past year, following a wildly successful two-stage unofficial house party at SXSW. Practical Alchemy finds Redefine on the East Coast for the first time. The showcase, to take place at Shea Stadium, will bring a varied and unlikely collection of performers to the well-known DIY venue. Headliners Lucky Dragons will execute their standard goals of creating positive shared spaces which encourage crowd participation and collaborative music-making; Wires Under Tension will engage the audience with their blend of electronic and classical music, while premiering video art crafted by UK artist Peter Liversidge. Philadelphia’s RYAT and Brooklyn’s Big Spider’s Back will contribute heavily electronic sets with live processed video art, and experimental composer duYun will bring the lineup full circle with her avant-garde and classical bent. Additional details and videos for each of the performers can be seen below. Practical Alchemy will not only attempt to unify sound and motion art, but all-ages crowds and mature audiences as well, while exploring how far a lineup can stretch stylistically while still feeling cohesive. Born in May 2004, REDEFINE is a robust publication which covers niche subgenres and is comprised of selective musical tastemakers. The publication stays true to its ideals by employing democratic processes and by not compromising quality for quantity; REDEFINE takes pride in curating innovative, genre-bridging events, and takes the same approach to its arts coverage. A Lucky Dragons performance is more than just a live show; it is an interactive experience full of wonder that must be seen to be believed. With sets reminiscent of childhood science experiments, the Los Angeles-based duo of Luke Fischbeck and Sarah Rara craft feel-good environments. The goal, and the reality, is that their efforts encourage group experimentation and participation in engaging, improvised ways. By incorporating the dramatical swiveling and crescendos of classical music with the complexities of electronic gadgetry, Wires Under Tension put on a live show that feels simultaneously tense yet graceful. Premiering exclusively with this Northside showcase will be additional visuals, provided by UK-based multi-disciplinary artist Peter Liversidge, whose work you can view below. Download/stream a mixtape crafted by Wires Under Tension’s record label, Western Vinyl, HERE. Performances with live visuals are becoming commonplace, but RYAT’s professionalism and dedication in this arena sets them apart. Paired with video artist Annapurna Kumar, RYAT’s live shows are executed to perfection, highly tech-savvy and remarkable examples of sound and motion art synthesis. Read our live show review of their performance with Pegasus Dream HERE. Former Seattlite Big Spider’s Back (aka occasional REDEFINE staff writer Yair Rubinstein) will be releasing his self-produced, self-recorded, and self-mixed later this summer. Building off of his previous EP, entitled Warped, his new album will expand on his dreamy, psychedelic sample-based pop, and the live show will include real-time, processed video art! Listen to his music on bigspidersback.bandcamp.com. Chinese composer duYun primarily has her feet in the experimental jazz world, but we are excited to bring her avant-garde music and performances to the Northside Festival crowd. Exepect a plethora of musical instruments and atypical setups, as well as some visually-stimulating components! We will be streaming her new record, Shark In You on our website in the next day. Stay tuned. See other videos of her performing HERE and HERE.